On Demand is a video sharing project, produced by the Duke Office of News and Communication (ONC) in collaboration with the Duke Office of Information Technology (OIT), which is entrusted with organising the content. The platform has been built using open software in order to construct a free, interactive, database of academic videos. Videos are searchable by category or by referencing the Duke selections: New Videos, Popular and Featured. The Politics and Policy section includes more than 250 lectures, talks, interviews and short interventions covering a wide range of topics, from voting and elections to war and human rights. 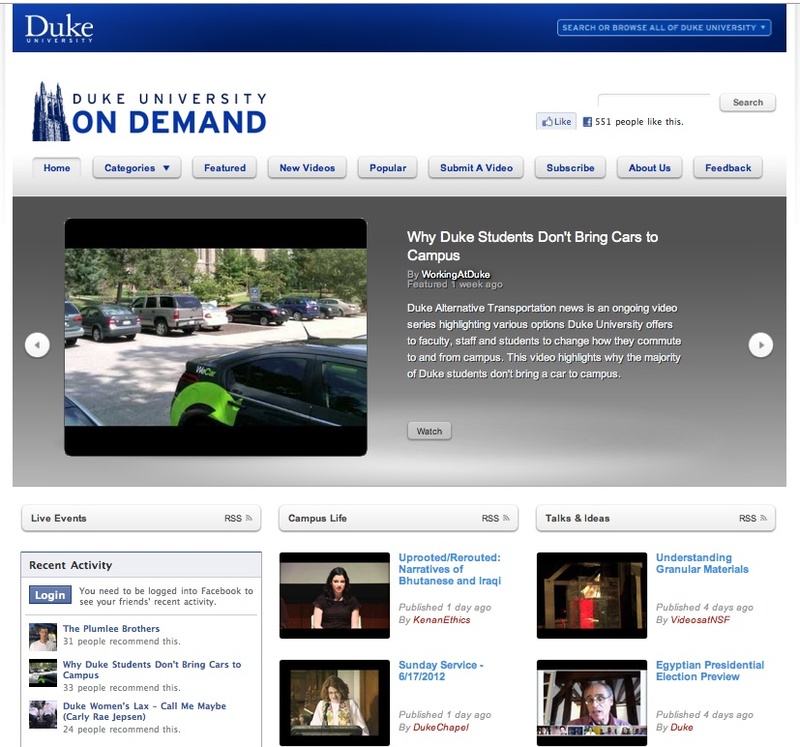 While the quality of the video recordings is variable, as is the relevance of the contributions, Duke OnDemand is a helpful tool for researchers, students and public users. Users can submit videos freely available on the web, which will be reviewed before posting. Every video can be viewed, shared and commented on. RSS feeds are available for each category. Related to the OnDemand project, The Duke Idea is a ‘personalities’ section. The brainchild of the Duke Alumni Association of the Duke University, The Duke Idea is a series of more than 20 talks led by President Richard H. Brodhead and various Duke leaders. The talks focus on the future of the university, challenges and prospects.